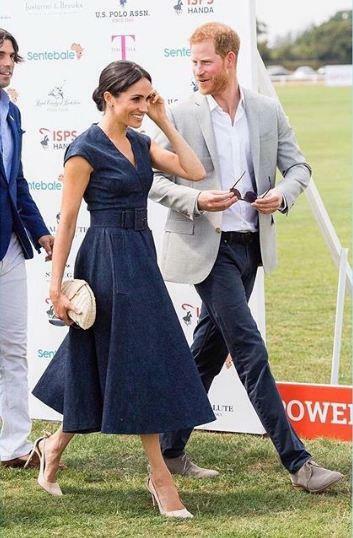 Meghan Markle attended the Sentebale polo match in Windsor today to support her husband, Prince Harry. Although she didn't play at the polo match still she played an important role in the competition. The Duchess of Sussex awarded the winning team, which included her hubby. After the match, she met the champions and handed a trophy to the team captain, polo star and Harry's lifelong friend, Nacho Figueras. Then she turned around and gave her husband a quick kiss and put an arm around him before congratulating the other players. She also gave him a rub on the back, and they held hands. Both of them have showcased their PDA at public appearances several time. The only time they've kissed in public was on their wedding day, outside the steps of St. George's Chapel. At the Queen's Young Leader's Awards in Buckingham Palace, an affair they co-hosted with Her Majesty, the couple refrained from hand-holding and any other PDA because it wasn't appropriate for the setting. The polo match, however, wasn't an official royal outing, so it was likely more fitting for the couple to get cosier. Meghan wore a denim belted wrap dress by Carolina Herrera for the occasion, paired with neutral Aquazzura pumps and a J.Crew basket clutch.